Process Record Filter | Mitchell Scientific, Inc. The Process Record Filter enables the user to output information about one or more process records to Excel. Process records can be filtered by many different attributes (Process Name, Process Model, Evaluation Date, Vessel Name, and others). Once the filter has been set then the records that meet the filter specifications are listed. 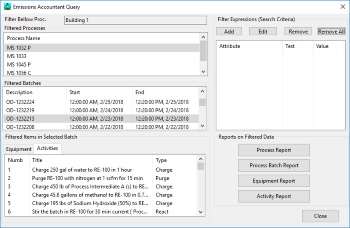 Process Report – Presents a list of process record names that meet the filter specifications. 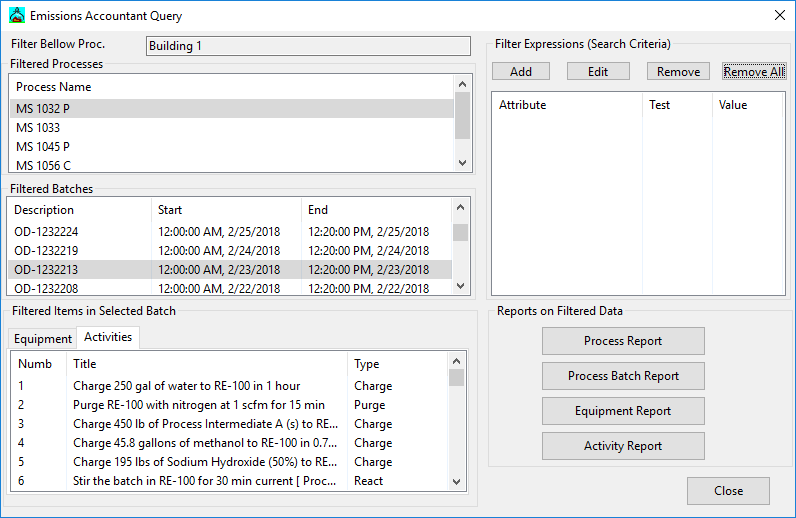 Process Batch Report – Generates a list of all batch and period production records for the selected processes. Equipment Report – Creates a list of all process vessels that are featured in the selected process records. Activity Report – Outputs a list of process activities that are contained in the selected process records. This information consist of the processing steps that are included in the batch recipe.